Every sport and fitness activity has a own unique set of risks and rewards; however, certain activities come with a very specific type of injury often seen by your physical therapist. People who enjoy endurance sports, i.e., running, biking, or triathlons, face an increased risk of “overuse” injuries, which may not sound serious or dramatic but can put you on the sidelines all the same. We explain what these injuries are and how to prevent them, as well as what to do if you suspect you may have overdone it. Any sport can result in an overuse injury, since these are typically the result of the body sustaining repetitive stress. It then only stands to reason that activities known for repetitive motion performed for a continuous amount of time tend to end up with a higher rate of overuse injuries. Sports like distance running, distance cycling, and triathlons see a fair number of these issues. From tendonitis to stress fractures, overuse injuries can occur when your tissues have accumulated too much stress, under improper form, or even with ill-fitting fitness gear (shoes, bike, etc.). It’s always better to prevent an injury from occurring than treat one down the road. For endurance sports, ensuring that any gear you need fits you appropriately is key. For runners, finding the right shoe may take more than a quick trip to the mall. Specialty running stores typically have skilled employees who are trained to fit you based on your gait, goals, and more. Bicyclists can also find a professional bike fitting at many specialty stores to ensure that the bike is the correct one for their unique needs. Once you’re sure that you have the right gear, the right training program is also essential. Doing too much, too soon is a common cause of overuse injuries. Instead, be sure you’re gradually increasing your training and giving your body plenty of time to both acclimate to the demands you’re placing on it, as well as adequate recovery time on non-training days. For a suspected overuse injury, you can attempt conservative self-care at home with rest, ice, and modifying your activities. If your pain and/or symptoms persist past a week or more, it’s time to call in the pros. Scheduling a visit with your physical therapist is an excellent way to determine not only what your injury may be, but to get a jump on healing. No one likes to take time off of training; however, it’s better to figure out any training missteps now and correct course than continue risking further injury or even risk missing your goals. You can often see a physical therapist sooner than a primary care physician: your PT will communicate directly with your doctor about both your treatment, as well as for any referral needs. Your PT will assess your injury, your history, activities, movement patterns, balance, strength, and more to determine factors that could contribute to your overuse injury and will then develop a customized treatment plan. By following your physical therapist’s treatment plan, you will work toward healing and also help prevent future recurrence of the overuse injury. Worried that you overdid it and are paying the price? At Body One Physical Therapy, we see clients of all ages and activity levels. Body One also offers programs designed to help detect potential injury risks and correct form and movement issues so you’re less likely to end up with one of these common injuries. Call today and ask about our Performance Ability Testing as well as our Sustained Optimal Performance programs. While different, each program focuses on injury risk reduction through working with one of our talented physical therapists. Call today to learn more or to schedule an appointment. 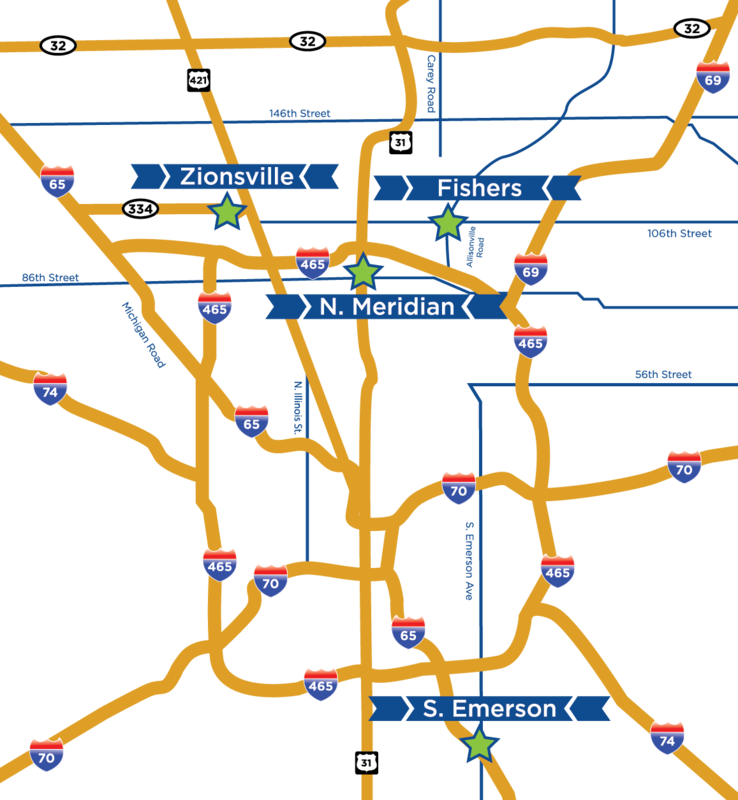 Body One is locally-owned, with four locations serving Central Indiana: North Indianapolis, South Indianapolis, Fishers, and Zionsville. Make your appointment today and start living your best life!